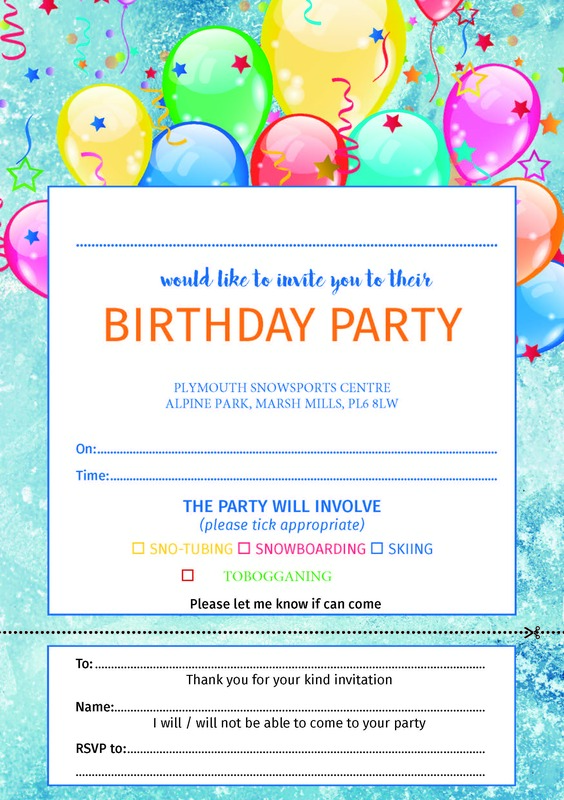 Plymouth Ski & Snowboard Centre has a broad range of different and fun activities to turn your child’s birthday into a memorable day. Our parties are also great for groups such as guides, scouts and football presentation nights.On the day you will be asked to arrive a minimum of 15 minutes before your activity start time. 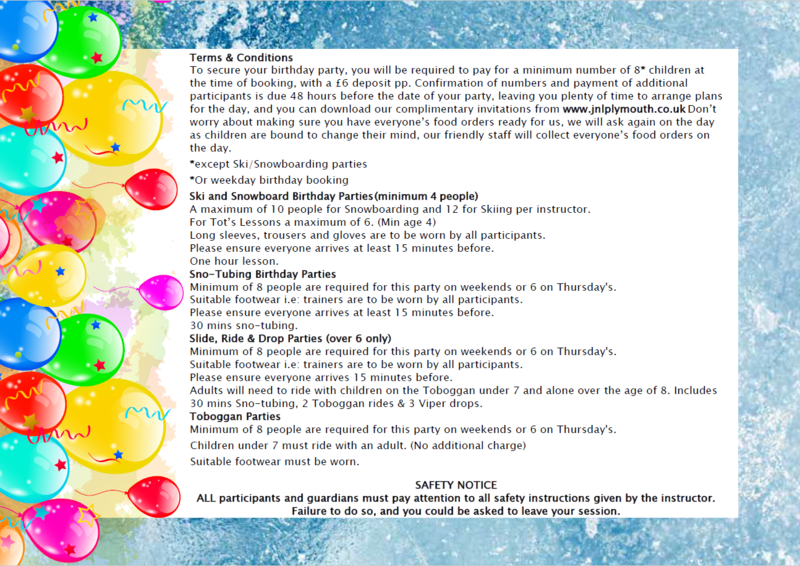 Activities: Activities last 1 hour depending on the number of guests. Meal: Children are taken to the The Alpine Lodge Restaurant to enjoy their meal. Pick-up time: Parents & guardians are advised to pick up their children 2 hours after arrival time unless told otherwise. Please be aware that due to the nature of our activities the timings can sometimes over run. 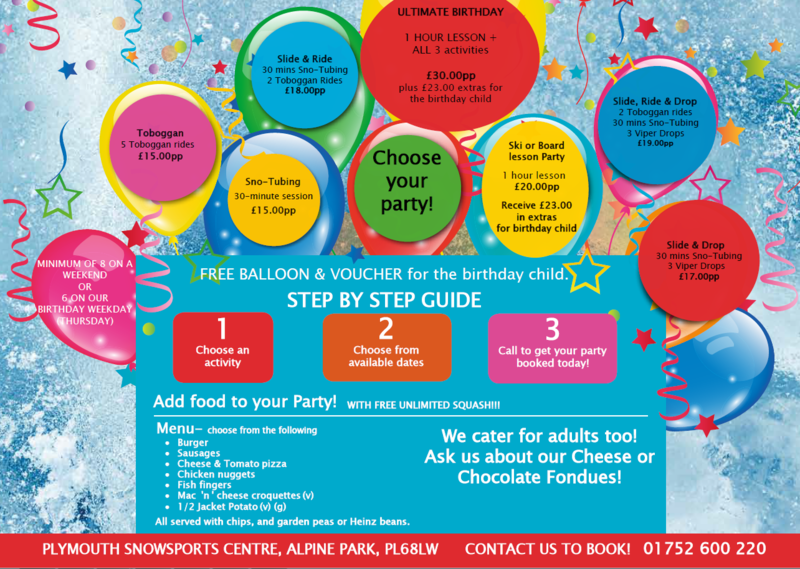 Check our leaflet to learn more about our birthday packages. 2 rides on the toboggan. Ages 4 – 7 Must ride with an adult on the toboggan with the adult in control. A hot meal and dessert. Minimum of 8 and maximum of 15 people per party. 1 hour ski lesson with a trained instructor. Minimum of 4 participants. Max 12 per 1 ski instructor & 10 per snowboard instructor. Please inform us if you would like more than 12. Arms and legs must be covered and must have gloves. 1 hour snowboard lesson with a trained instructor. Minimum of 4 participants. Max of 10 per 1 instructor. Please inform us if you plan to have more than 10. Children must be aged 6 years+. Jacket Potato with cheese and/or Heinz beans. All served with an Ice Cream or Jelly dessert. Gluten free food is available – please inform staff when booking. A non-refundable deposit of £6.00pp is required on booking. An email confirmation will then be sent with invites attached. Balance payment required 48 hours before. Refunds are available up to 48 hours prior to activities less 25% of the original fee paid. *Please note that our parties do not include party bags or a cake. A table is set for children in the restaurant with a birthday balloon. Parents are welcome to provide any extras they wish for the table but are asked where possible to bring these in before the day of your party. All our weekend packages with food include the assistance from our party coordinators and an allocated area in our Alpine Lodge. On arrival please make yourself known to our reception team who will greet you.